Design, build and operate an advanced, customer-focused contact centre solution to resolve overflow calls for Australia’s third largest internet service provider (ISP), providing seamless integration with iiNet’s culture, customer satisfaction metrics and performance criteria. Turnkey outsourced contact centre solution. How satisfied were you with the service you received on the call? How satisfied were you with the outcome of the call? Would you recommend iiNet to other users? The scores generated from the questions provide almost immediate feedback on agent performance and provides a high correlation between the level of agent performance and customer satisfaction with the iiNet brand. Because of this, the NPS score drives a disciplined approach to every client interaction. Feedback from each call score is used to stay in touch with the customer base, their service experience and needs, and respond proactively to close any customer experience gaps. The project would need to recreate the focus, performance and energy of the existing iiNet contact centres, in a new location many thousands of kilometers away in another time zone. iiNet already ran successful contact centres in Australia and New Zealand, but wanted to implement a follow the sun strategy. iiNet began researching the viability of taking a contact centre offshore and creating a state of the art, advanced contact centre facility in a time zone where it could roll out its follow the sun strategy and relieve the burden on local staff of having to work unsociable shifts that took them away from their families and affected their quality of life. The challenge for all the parties involved would be translating iiNet’s unique, customer-centric service approach to a partner where it would not only be understood, but embraced and lived through every interaction, on every call. The project would need to recreate the focus, performance and energy of the existing iiNet contact centres, in a new location many thousands of kilometres away in another time zone. The brief was to create an outsourced facility that was, quite simply, an extension of iiNet’s business in every single detail. This project would be the first Australian project outsourced to South Africa and had the potential to create a number of opportunities for both parties. Underperforming agents are mentored and allowed the opportunity to rectify their areas of weakness through focused development in the Development Academy. This is a far more supportive environment and invariably results in these agents achieving the necessary targets. 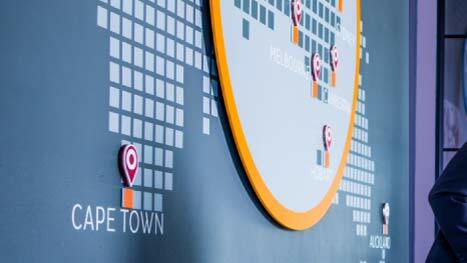 The new Cape Town facility soon generated a unique energy born out of iiNet’s complete focus on client satisfaction and client feedback. Our agents field a wide range of complex and technically challenging calls, including tech support, billing and sales. iiNet customers generally have a high level of technology literacy – they are a discerning customer base to service. In addition to keeping these customers happy, the Merchants agents have been praised for their warm and patient approach to less knowledgeable callers, which has added another element to iiNet’s customer service experience. Although the physical logistics on the project were exceptionally complex, Merchants achieved outstanding project delivery and there were no major delays or problems leading up to the ‘go live’ date. The Merchants agents have been praised for their warm and patient approach to less knowledgeable callers, which has added another element to iiNet’s customer service experience.